« Set your clocks back tonight! Click on the screenshot below to see how important the drivers feel that cats are to their success. They touch them for luck! This is possibly the cat painting that can best be equated to the enduringly famous Dogs Playing Poker. However, the anthropomorphization in Abraham Teniers’ work predates its canine companion by nearly 400 years, and the surreal nature of its subject matter is quite captivating. Teniers was part of a Flemish artist family who specialized in genre paintings of villages, inns and, as logical follows, monkey scenes. The monkeys stay in this painting, but the cats are undeniably the stars, getting coiffed and ready for the weekend, served by their attentive monkey servants. There is curiously a cat in a sling to the right and a Puss in Boots-type at the door. It is a scene rich in action and the bizarre. Arthur Rackham was one of the great book illustrators of the early 20th century. This painting took inspiration from a Brothers Grimm fairytale, in which the eponymous ‘she’ is a shape-shifting witch who turns virgins into birds and cages them. There is a malevolence in the cat’s expression and posture, which very much demonstrates why the cat is the witch’s animal of choice, and it is no real leap here to see that the cat is the animal form of a dastardly witch. With his work on other tales such as Hansel and Gretel and The Wind in the Willows, Rackham proved that he was quite adept at portraying states of mind through animals. Meow. There is something very natural about a fish and a cat. That the fish is a cook’s fish means that the cat in this painting has a much easier job than his brothers in the wild, but there is still a playfulness in this painting, as the cat paws the object of its desire. The cook looks oblivious to the feline thief, as he attends to the rest of his meal, although he could be purposely ignoring the fact so that his furry friend can get a treat. Ribot was a prominent Realist painter — this everyday scene was very much in his typical style, offering the viewer a peek into the kitchens of the mid-1800s. One of David Hockney‘s most impressive and renowned pictures is a portrait of his friends, the fashion designer Ossie Clark and the textile designer Celia Birtwell — and their cat Percy. Hockney created the portrait shortly after the couple’s wedding. It is rife with symbolism, and Percy is an important part of this. As he looks aloofly out of the window, more than just representing cat-hood, it alludes to infidelity, envy, and Clark’s bisexual affairs which plagued the marriage and eventually led to its demise in 1974. Hockney commented that the aim of the painting was to “achieve […] the presence of two people in this room [with the main aim being] to paint the relationship of these people.” Sometimes all you need is to add a cat to speak volumes on relationships. This list shall end with one of the most harrowing pieces of art — cat or no — to ever have been created. Bosch is far from being the only person to take the story of the temptation of St Anthony as the subject of a visual art piece, but this is certainly among the most well-known interpretations of it. The triptych tells the story of the mental and spiritual torments experienced by St Anthony, and as was Bosch’s signature, it contains a variety of fantastical, mythical and disturbing imagery. On the right panel, in the wilderness, you will see a cat hissing at a woman who is trying to tempt hermit Anthony with her naked body. The fish is a symbol of Christianity, but cats — particularly this one, with its horn-like ears — were often emblems of the demonic. Remember, there are five other paintings (or famous photos) at the site, so go look. This entry was written by whyevolutionistrue and posted on November 4, 2017 at 9:00 am and filed under Caturday felids. Bookmark the permalink. Follow any comments here with the RSS feed for this post. Both comments and trackbacks are currently closed. Love those paintings and photos. Throwing the cats across the room is a little drastic. The turning vane would be aerodynamics which is the name of the game in F1 design. Everything is to manage airflow, minimize drag all accomplished with computer design and wind tunnels. Every bit of it is to reduce drag or increase down force. 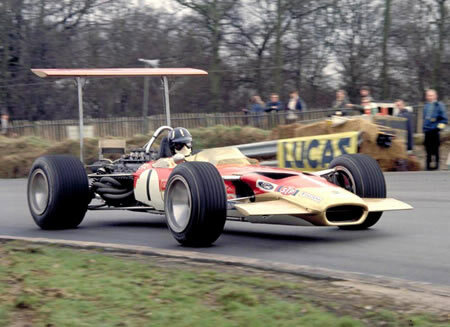 It’s all been about aerodynamics since Lotus fitted wings to their cars in 1968. Up until then ‘streamlining’ was seen as a way to reduce drag, but Lotus showed aerodynamic effects (i.e. downforce) could dramatically improve cornering power and the benefits vastly outweighed even the obvious drag penalties of the early wings. Wow, that is a throwback. Even the somewhat crude wing on the front was there and the front tires look like regular car tires with tread on them. 1968 is the year I graduated high school, boy am I old. I think that was the original wing that led to all sorts if road cars sprouting wings on the boot (trunk) lid. – talk about drag! The idea was to keep the wing in ‘clean’ air. They were soon banned after a couple of wings came loose causing loss of control so F1 cars reverted to low wings both ends. I love Arthur Rackham’s illustrations! Thanks for showing this one. Turning vanes perform in a similar way to ‘winglets’ – the turned up bits at the wing tips of gliders & the larger powered airplanes [also now appearing on the tips of helicopter & drone rotor blades]. The object being to smooth out airflow at troublesome sudden air pressure transitions. e.g. Turning vanes were first used in air conditioning to smooth out the flow of air around a turn in ducting using a grid of blades in the path of the air [the aim being less noise & more efficient flow]. I assume ‘turning’ refers to the change in path of the airflow. In flight winglets are a way of minimising air slipping from under the wingtip to above the wingtip – this air ‘slippage’ ACROSS the direction of laminar airflow creates vortexes of air spinning out behind the wingtips [vortexes are BAD in aerodynamics most of the time]. The vortexes are smaller with winglets installed, thus lift is increased & less energy is eaten by turbulence. In the case of drones the main aim is to reduce high-pitched noise. As a youngster I admired and studied the paintings of Yeroun (Hieronymus) Bosch. (The ‘ch’ the end is silent, so it is Bos, meaning wood or forest, but in case he came from ‘s Hertogenbos, a Dutch town, “the Duke’s wood”). His ‘hells’ somehow appear more inspired than his ‘paradises’. His greatest tryptich, “the Garden of Earthly Desires” is in the Prado in Madrid. One can look at that painting for days, and not get enough of it. The Hockney hangs in Tate Britain and is a great favourite. Light floods from a large canvas. If it’s “The top 10 cats pictured in famous art” and not “The top ten famous pictures featuring cats”, then we’re going to need to know which of the (by my count) six cats pictured in the Teniers is the nominee. Abraham Teniers is an example of an ‘ancient’ painter who painted cats quite realistically, it appears.